How Do We Convert a Number into a Finger Trajectory? What does this post have to do with judgment and decision making? In the long run, it might have some connection. For now, I just think that it is a cool experiment. Although Dehaene probably had a secondary role in this, he always seems to make complicated things seem simple. “How do we convert a number into a finger trajectory?” Dror Dotan and Stanislas Dehaene, appeared in Cognition 129 (2013) 512–52. The invention of multi-digit numbers is a major achievement that took mankind centuries to develop. The innovation was the idea that large numbers can be represented with merely 10 symbols by relying on their relative positions. During education, the human brain learns the decimal system and, ultimately, it becomes very intuitive that the digit 4 in 41 stands for four decades, while the digit 4 in 14 stands for four units. But what is it exactly that we understand? How does our brain represent multi-digit quantities, and what are the processes that convert a sequence of digit symbols into this quantity representation? In investigating these questions Dotan and Dehaene aimed not only to describe the various cognitive representations of numbers in educated adults, but also to dissect the successive stages by which multi-digit Arabic numbers are converted into quantities. Study participants performed a number-to-position task on an iPad tablet computer, which allowed continuous measurement of the finger trajectory. On each trial, a two-digit number between 0 and 40 was shown on the iPad screen, and the participants dragged their finger from a fixed starting point at the bottom of the screen to a position along a number line that was at the top of the screen (see Fig. 3 excerpted above). The experiment software digitized the entire finger trajectory. Finger trajectories are a powerful measure because the finger position at a certain time during the trial tightly tracks the underlying cognitive operations. Thus, analyzing the finger positions at different times in the trial could reveal how the quantity representation of two-digit numbers evolves over time. The study evaluated different models that assume either holistic or decomposed representations, linear or logarithmic quantity scales, similar or different processing of one digit and two-digit numbers, and the last model also assumes a spatial strategy to aim the finger to the desired position. Each of these models predicts a certain spatial mapping of numbers to positions as well as a certain temporal pattern of finger trajectories. 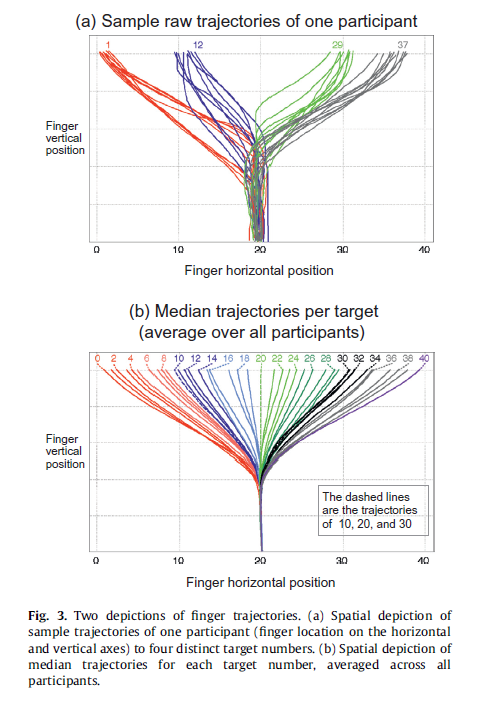 By analyzing various parts of the finger trajectories, Dotan and Dehaene reject some models and probe which of the models best fits the observed trajectories. The predictions of the models are illustrated in Fig. 2 as simulations of the predicted trajectories. These simulations are over-simplified since they ignore several parameters such as the fact that the finger changes its direction gradually and not abruptly, the fact that the finger velocity is not constant, and the existence of noise. Their purpose is only to convey graphically the variables that are supposed to influence finger trajectories. They assume a 1300 ms time from start to touch. (a) The holistic model (Fig. 2a) assumes a holistic quantity representation mapped to a linearly-organized number line. The simulation assumes that at 400 ms the trajectories branch towards the target position along a linearly-organized number line. (b) The sequential model (Fig. 2b) assumes that the quantity representation is decomposed, and that the decade digit is processed earlier than the unit digit. The simulation assumes that at t = 400 ms the finger starts moving towards the position of the relevant whole decade (because the unit digit information is still unavailable at this time). At t = 600 ms the unit digit was processed too and again the trajectories branch apart, this time towards the correct target position along a linearly-organized number line. (d) The transient log model (Fig. 2d) assumes that a holistic, logarithmic quantity representation is first constructed, and this representation is then overridden by a linear representation. The simulation assumed that at t = 400 ms the finger starts moving towards the target position along a logarithmically-organized number line, and at t = 600 ms the finger direction is re-adjusted to aim towards a linearly-organized number line. (e) The decomposed digits model (Fig. 2e) assumes that on top of the two-digit quantity, the quantities of each of the digits would also affect the finger position. One possible mechanism which may create such an effect is the existence of an intermediate stage in which the two digits of the target are not yet fully assigned to their respective unit and decades locations. For a transient period, the two digits would therefore be floating and potentially submitted to illusory conjunctions: the unit digit might be partially bound to the decade location, or vice versa. The resulting quantity representation will be a linear combination of the two-digit quantity with the single-digit quantities. (f) The spatial reference points model (Fig. 2f) is specifically concerned with the process of translating a quantity into a spatial position on the visually presented number line. Inspired by previous work on the role of reference points in proportionality judgments, it assumes that the target’s position on the number line is estimated with respect to three reference points: the two ends of the number line (0 and 40) and its middle (20). Crucially, these estimated distances are scaled by a compressive function, giving rise to a non-linear bias term which pushes the participant’s responses away from the reference points. The six models are not necessarily mutually exclusive. The results were generated by 21 subjects nearly evenly divided between left to right and right to left native readers. Based on the results, Dotan and Dehaene suggest that the series of stages dominating the present task, possibly organized in a cascade, are likely to be: identification (160 ms), quantity (170–210 ms), representation of the (linear) target location (290 ms) and first finger deviation towards it (400 ms). Finger location was also predicted by the logarithm (Power function could also work.) of the two-digit target number. This factor was a reliable predictor of the implied endpoint from 450 ms until 750 ms post stimulus onset. It indicates that a compressive quantity representation exists during an intermediate time window. In other words, the finger movements are clustered more in the middle toward 20 during that time window than they would be if the relationship were purely linear. According to Dotan and Dehaene, the finding that the log factor started early and then disappeared suggests that the activation of a compressive representation is automatic rather than the result of conscious reasoning. Another alternative explanation is that the logarithmic effect results from a spatial or motor bias that is unrelated with the representation of quantities. A separate experiment excluding the number and just tracing finger movement from the start to a point on the screen did not include the logarithmic effect so the spatial or motor bias explanation was eliminated. 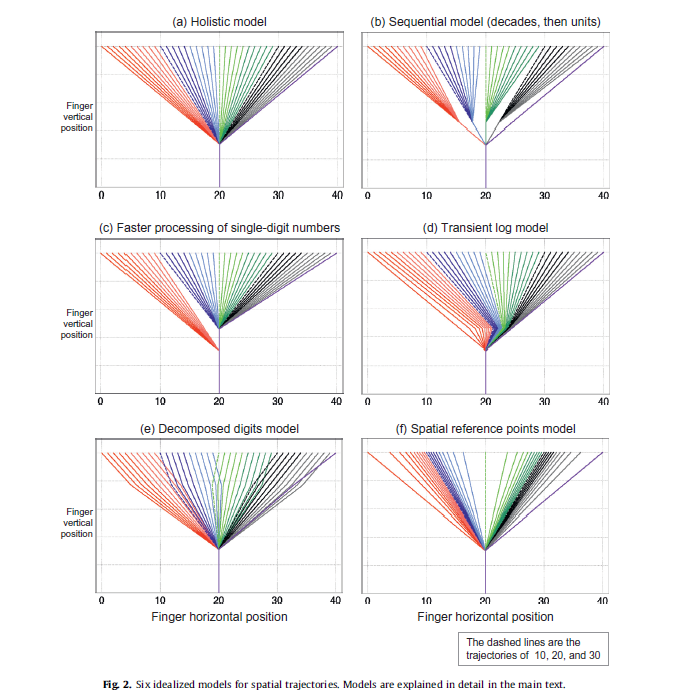 Dotan and Dehaene assert that the finding of a logarithmic contribution to finger position indicates that the quantity representation is not only compressive but also holistic. The results do not support a sequential model, according to which the decade digit is processed before the unit digit. No time window was found in which the effect of the decade digit on the finger movement was larger than that of the unit digit. The results are therefore in accord with previous studies that showed parallel processing of two-digit numbers. There was no evidence that single-digit numbers are processed faster than two-digit numbers. The last factor to influence finger position was a spatial reference-point bias function (SRP), which was a reliable predictor of the implied endpoint from 600 ms post stimulus onset and in all later time points – even the endpoints. This factor suggests that the target position in the number-to-position task is obtained using a non-linear estimation of the distances to three fixed reference points: the left end, middle, and right end of the number line. The figure above labeled “Median trajectories per target,” shows this as a tendency for the final target to be closer to 10 than it should be for numbers from 0 to 20 and closer to 30 than it should be for numbers from 20 t0 40. They also found a overall leftward endpoint bias for which they have no explanation. Organizing these factors along a timeline clarifies the process performed in the number-to-position task. When the two-digit target number is presented, the participants first create a transient quantity representation of the unit digit (or, alternatively, a quantity representation of the transposed number, e.g., the quantity 52 upon seeing the target number 25). This representation is activated surprisingly quickly, as it affects the finger direction (implied endpoint) as early as 300 ms after the target number was presented. Shortly afterwards, two separate representations of the two-digit quantity are created: a holistic logarithmic representation and a linear representation (either holistic, or decomposed with the unit and decade digits contributing in almost exact 1:10 ratio). The log and linear representations must be active at about 300 ms, since they start affecting the finger direction (implied endpoint) 450 ms and 400 ms after the target onset, correspondingly. The linear representation remains until the end of the trial, but the log representation is transient: 800 ms after the target onset, it no longer affects the implied endpoint. Finally, as their finger approaches the target line, the participants start adopting a spatial strategy of transforming the two-digit quantity representation into a precise location on the number line. This strategy, which has a measurable effect 600 ms after the target onset, relies on three reference points (the left end, middle, and right end of the line), and results in a bias that pushes the finger trajectories away from these reference points. Dotan, D. and Dehaene, S. (2013). “How do we convert a number into a finger trajectory?” Cognition 129, 512–52. This entry was posted in neurons/brain and tagged Dehaene on January 24, 2014 by admin.